Today I’m sharing a zucchini recipe. Our girls won’t eat zucchini yet, but my hubby and I love it. It’s in season late Summer here in Michigan so it’s very inexpensive. They’re usually BIG too. Zucchini reminds me of a cross between a cucumber & an eggplant. I’ve stuffed them before, but these turned out extra tasty. It was hard for us to stop with just one. In fact we didn’t. That piece down there barely lasted the photo shoot. Preheat oven to 350 degrees. Scoop out center of zucchini with a spoon. Not too much though. Use the photo as a guide. Prepare a baking dish that will fit the zucchini boats in it with a little olive oil spread all over. Also, rub olive oil on zucchini’s inside and out. Sprinkle a little salt on each one. Chop the zucchini that you scooped out up into big chunks and set aside. Chop the tomato up and also set aside. Chop onion, mushroom, and garlic. Prepare a medium sauté pan with a tablespoon of olive oil on medium heat. Add only the onion, mushroom, and garlic. Sauté 5 minutes and season with a little S & P. Turn off heat. Now add the zucchini and tomato. Pour into medium glass/ceramic bowl. Add bread crumbs, egg, parmesan cheese, parsley. Mix well with hands but not too long so it turns too soupy. Stuff the zucchini with the stuffing. I used my hands for that too. Sprinkle them with a little mozzarella and S & P to taste. Bake 45 minutes. Serve hot as a carb/veggie as one. Goes great alone or with a nice steak, or chicken. If you want less calories, use Pam instead of olive oil, and use reduced fat cheese. Zucchini Sales are up in Southeast Michigan. That zucchini recipe looks great, perfect for supper tonight – thanks Julie! Make this Lisa! It’s so good!! 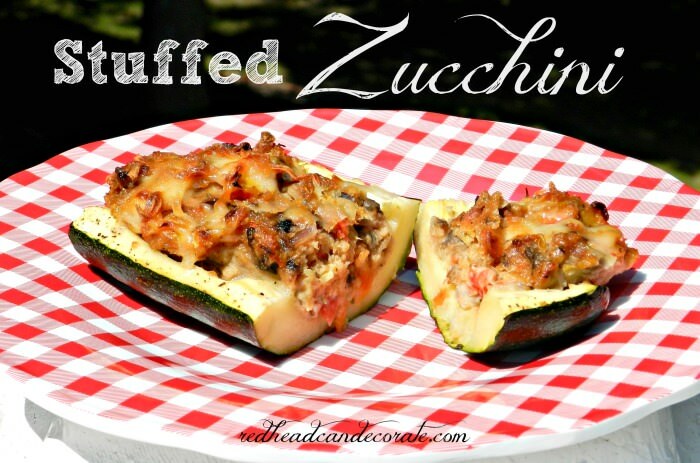 I love stuffed zucchini! Yum! Oh girl, this looks SOOO good! Mmmm. And love Sherry…she’s so fun! SO DELISH!! Thanks for sharing Julie and Sherry!! PINNED. Making these for birthday party. Already prepped. They look so good. Can’t wait to eat them later. Thank you for being you!! That is so awesome, Tracy! They really are so yummy!! Zucchini was a success. Keeper recipe. I’m not all that fond of zucchini myself except for making zucchini fries breaded and baked in the oven……..Yum. I did make and can 9-1/2 pints of zucchini relish yesterday morning early. Was all done canning by 5:30am and that is including doing the dishes and cleaning up afterwards. I like doing the canning early in the morning hours before it gets too hot. We hit 90 deg. the other day.